State Representative Brian K. Sims is a distinguished policy attorney and civil rights advocate from Center City Philadelphia. The former staff counsel for policy and planning at the Philadelphia Bar Association, he recently stepped down as both the president of the board of directors of Equality Pennsylvania and as chairman of Gay and Lesbian Lawyers of Philadelphia (GALLOP). He also has extensive experience as a guest lecturer. He is dedicated to making Philadelphia safer, strengthening and protecting public education, preserving services for seniors and other vulnerable Pennsylvanians, making affordable health care more available, expanding civil rights for all Pennsylvanians, preserving our environment while investing in alternative energy, creating jobs and cleaning up Harrisburg. During his time at the Bar Association, Sims worked with attorneys, legislators and community organizations on issues ranging from gender and pay inequity to environmental regulation. A member of the national campaign board of the Gay & Lesbian Victory Fund until August 2011, Sims lectures regularly about the policy and legal challenges facing the LGBT civil rights movement and is a regular lecturer at the Center for Progressive Leadership. He is the first out LGBT member of the Pennsylvania General Assembly. Before his time at the Bar Association, he practiced law as a disability attorney representing disabled professionals. He also worked as the senior law clerk at the U.S. Environmental Protection Agency’s Washington office, where he focused on state and municipal compliance and enforcement. He earned a bachelor of science degree from Bloomsburg University of Pennsylvania and a juris doctor degree in international and comparative law from the Michigan State University College of Law. In 2000, Sims, the son of two retired Army lieutenant colonels, came out to his football team after helping to lead them to the Division II national championship game as their captain. He remains the only former NCAA football captain to have ever come out, and is one of the most notable collegiate athletes to do so in any sport. Today he continues to serve on the GLSEN Sports Advisory Council, is a contributor to The Advocate magazine, and has written for The National Jurist, The New Jersey Law Journal, The Legal Intelligencer, Law.com, The Philadelphia Bar Reporter, MD News magazine, HRC Back Story, OutSports.com, Yahoo Sports and Compete magazine. 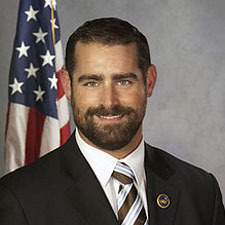 As a state legislator, he is honored to represent the neighborhoods of Pennsylvania’s 182nd District, which includes part or all of: Rittenhouse, Fitler Square, Logan Square, Midtown/Gayborhood, Washington Square West, Bella Vista, Hawthorne, Fairmount, Queen Village, East Passyunk, Spring Garden and Market East.